Small businesses often fail to manage their finances until it’s too late. Clutch surveyed small business owners and managers and found that while many small businesses believe they are overpaying their taxes or take risks, such as not separating personal and business bank accounts, 95% are still confident in the accuracy of their financial records. Successful small businesses must know how to manage their finances properly. Using outdated or improper financial and accounting processes, however, may be inhibiting small business revenue growth. Should you keep a separate bank account for your small business? What are the cash basis and accrual basis methods for tracking finances? Which method is best for tracking small business finances? Clutch surveyed over 302 small business owners or managers who are involved in their business’s financial decisions. We sought to learn how small businesses track their finances and what accounting challenges they face. Small businesses can use this report to understand where their small business accounting is falling short and the best processes for managing their finances. More than one-quarter of small business owners and managers (27%) say they do not have a separate bank account for their business – a potentially risky decision. 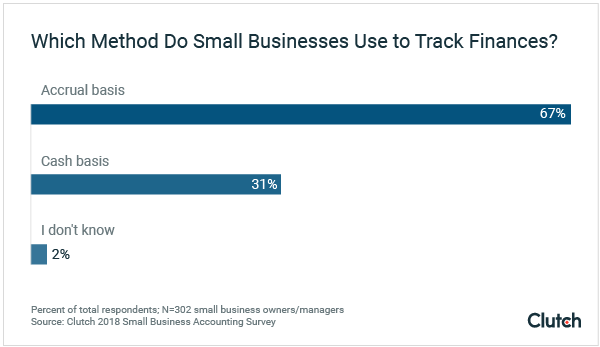 The majority of small businesses (67%) use the recommended accrual basis method for tracking finances, though the smallest businesses (fewer than 10 employees) are more likely to use the cash basis method. 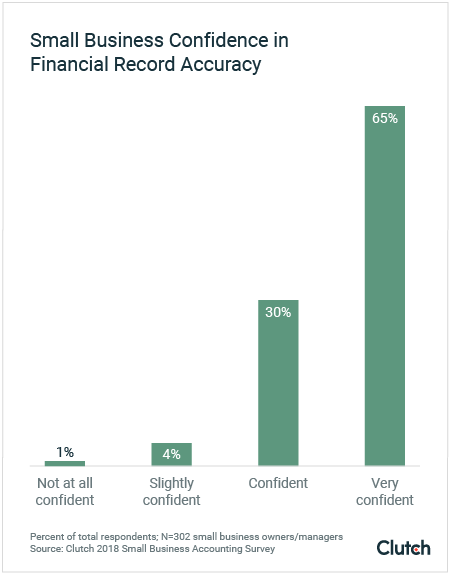 Nearly all small businesses (95%) are confident in the accuracy of their financial records, though experts are skeptical whether this reflects reality. 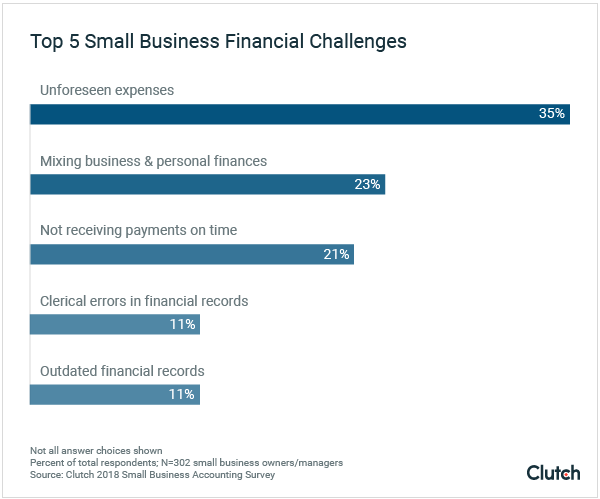 Small businesses list unforeseen expenses (35%) as their top financial challenge, followed by the mixing of business and personal finances (23%) and the inability to receive payments on time (21%). 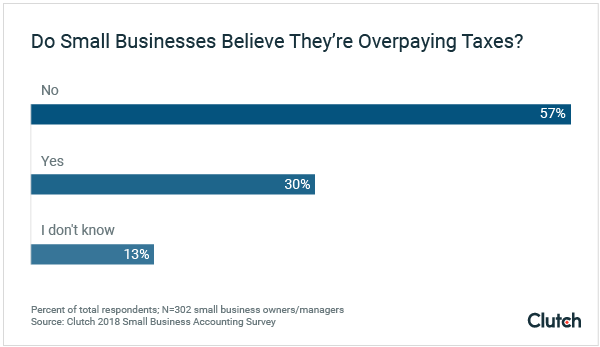 While most small businesses (93%) are very or somewhat confident in their ability to accurately file taxes, almost one-third (30%) also believe they are overpaying their taxes. Small businesses can maximize their potential financial success with a few simple tips. Running a small business is hard enough without the stress of confusing business and personal transactions. Yet, over one-quarter of small businesses say they do not have a separate bank account for their business. Established businesses are more likely to have separate bank accounts. Nearly 80% of small business owners of 5 years or more say they have separate bank accounts, compared to 68% of small business owners of 1-2 years or less. Some small business owners find ways to keep finances separate, despite keeping only one bank account. Yet, this strategy doesn’t work for every small business. In fact, nearly one-quarter of small businesses say they’ve encountered challenges with mixing business and personal finances in the past year. Having separate bank accounts from the start can protect your small business from future challenges. "Comingling of funds can make it virtually impossible to separate business transactions from your personal life," said Rhett Molitor, co-founder of Basis 365 Accounting, a cloud-based accounting service. "That will raise red flags for anyone relying on your financials (e.g. IRS, bringing in a business partner, trying to sell the business)." Separating personal and business bank accounts prevents future confusion, especially as your business grows. Small businesses have two different options for tracking their finances: the accrual basis method and the cash basis method. While some experts consider the accrual basis a better method, it’s important for small businesses to keep an eye on both. The majority of small businesses (67%) use the accrual basis method. What is the difference between the accrual basis and cash basis methods of small business accounting? For example, under the accrual basis, if you receive a bill on July 31, but don’t pay it until August 1, the bill would be recorded in your July expenses since that’s when it was received. Oppositely, under the cash basis, you would record the bill in your August expenses because that’s when the money actually left your bank account. Either method can work for your business based on your specific financial needs. “The cash method is best if you have a lot of transactions and deal directly with customers. Meanwhile, the accrual method is best if you deal with large businesses and don't get paid quickly.” Klassen said. While the accrual basis can work well for large businesses, it does have cons, such as limiting business owners’ understanding of cash flow. Smart small businesses keep track of both their earnings and cash flow. Stay on top of your small business’s finances by using both the accrual basis and cash basis method – and ensure you get a complete picture of your money. Nearly all small businesses believe their financial records largely are correct, but experts are skeptical of this claim. Businesses may miss minor mistakes in their accounting and therefore should seek outside help to cross check their work. Ninety-five percent (95%) of small businesses are confident or very confident in the accuracy of their financial records. Over half of small businesses (52%) say that the quality of their financial records has remained about the same since they began owning or managing the business. Meanwhile, 46% say the quality increased. Experts say that this may reflect small business owners’ perceptions more than the truth. “When we get a new customer, [their financial records are] almost never 100% accurate,” Molitor said. One explanation is that small businesses are unaware of accounting inaccuracies until an accounting firm or expert questions their balance sheet. “[Small business owners] can think that they’re fine. Then, they have someone skilled look at their balance sheet, their profit and loss, and say, ‘Hey, this is missing, or this isn’t categorized correctly,’” Medina said. Small businesses shouldn’t be afraid to seek outside help if they have any hesitations about the accuracy of their financial records – and they may need help even if they believe everything is correct. While small businesses are confident in their tax preparation skills, many still believe they could claim more deductions and credits. 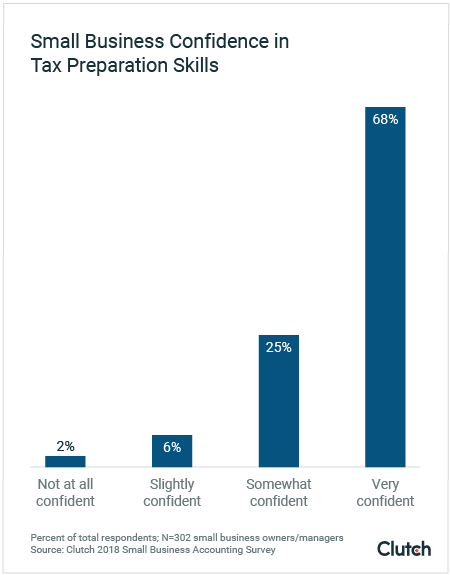 Almost 70% of small businesses are very confident in their ability to file their taxes accurately. One-fourth of small businesses are somewhat confident. Surprisingly, despite this confidence, almost one-third of small businesses also believe they are overpaying their taxes. Small businesses may be hesitant to seek outside help with their taxes due to cost and instead, opt to file business taxes themselves. Yet, the benefits of working with a tax advisor may offset the costs of working with outside help. Filing taxes can be a confusing and overwhelming task for many small businesses. Rebecca Miller, Owner of Peggy Jean’s Pies, a pie shop, shared that hiring an accountant significantly benefited her small business. “We work closely with our accountant. She's taught me how to do QuickBooks and a number of things in our point of sale system that makes preparing for taxes easier." While it's important for small businesses to save money, not seeking help when you need it actually may be more detrimental to your business. Properly managing money is central to the success of a small business. Although you may be confident in your small business’s financial records, it is easy to make a mistake. Have a separate bank account for your small business. Primarily use the accrual basis method for tracking finances, though it is critical to keep an eye on cash flow as well. Invest in outside help, even if you don’t think you need it. Clutch surveyed 302 small business owners or managers who are involved or very involved in their business’s financial decisions.